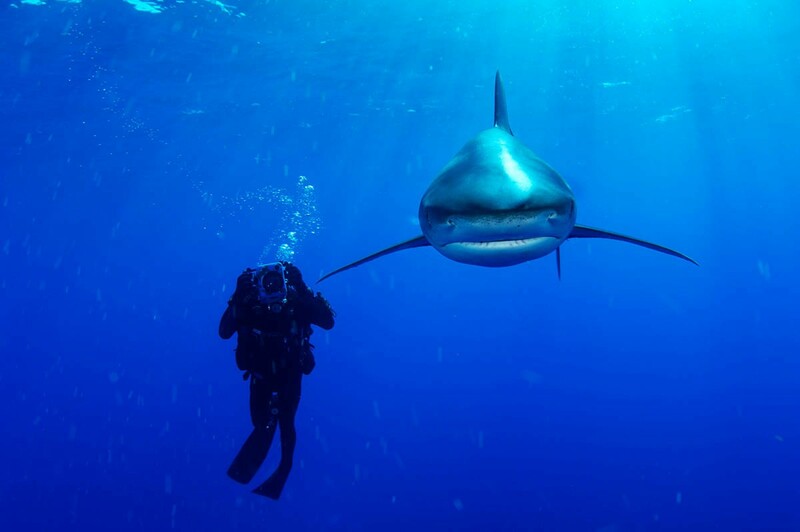 Skerry has photographed sharks of all species for the magazine; here is an Oceanic Whitetip next to a biologist. Audiences at Wednesday's National Geographic Live! event took a trip around the world's oceans without having to leave the icy streets of Spokane. For the third installment of the series' third season at the INB Performing Arts Center, award-winning underwater photographer Brian Skerry mesmerized with his tales of encountering sharks, whales, seals and other denizens of the world's vast ocean landscapes from behind his camera lens. 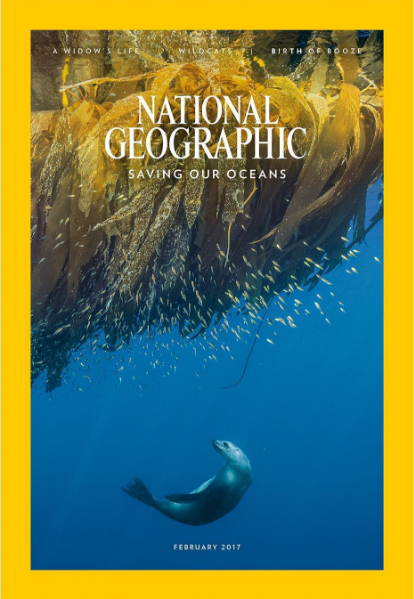 For those who missed it, Skerry has been photographing underwater landscapes and its inhabitants for three decades; his work has been widely published in National Geographic, and most recently for the cover story of this February's issue on the centennial anniversary of the U.S. National Parks Service. 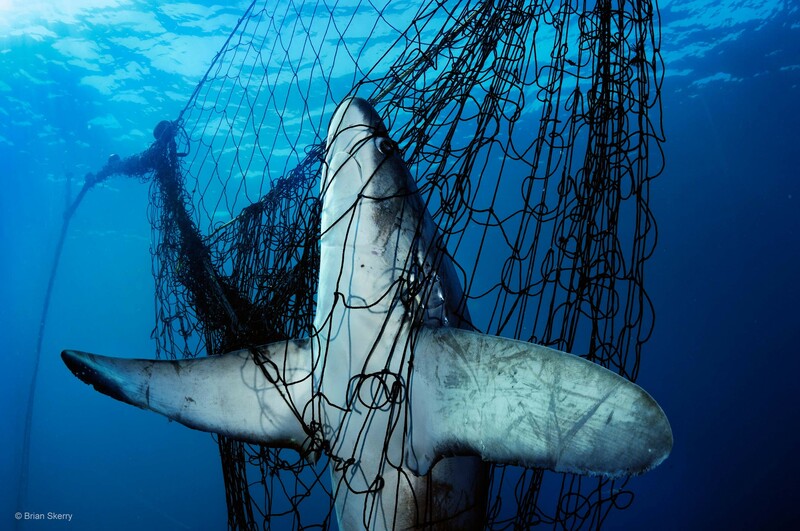 This thresher shark is one of countless unintended victims of gillnet fishing. Skerry's photos are featured in this month's cover story. the oceans as an unlimited resource, he says, and later encouraged audiences to be more conscious about the types of seafood products they're consuming. Knowing what you're eating and where it comes from should give us pause, he said, adding that while he does consume seafood, he is selective as to what species. At the close of his presentation, Skerry reminded us that even if we're not marine scientists or photographers, we can help protect the ocean and its magnificent creatures by voting with our wallets, and encouraging lawmakers to enact more protections of these precious environments. To see more of Skerry's stunning work, visit his website, and follow him on Instagram. The 2016-17 season of Nat Geo Live! hosts two more presenters in Spokane this spring. Go learn about a part of the world you've never been to when mountaineer Hilaree O'Neill shares her experiences on March 15, and when wildlife photographer Charlie Hamilton James presents "I Bought a Rainforest" on April 26. Tickets for each are $29.50; students get a special rate of $19.50.